Many species are commonly found off our coast! 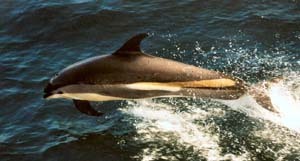 There are at least 85 different species of the order cetaceans: whales, dolphins and porpoises. They are divided into two sub-orders: baleen and toothed whales. 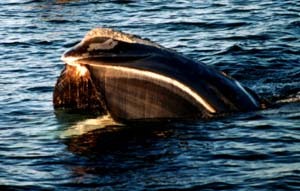 Baleen whales include the humpback, blue, fin, and minke whales. These animals have two blowhole openings on top of their head and have baleen plates hanging from their upper jaw. These baleen plates help whales filter lots of small fish and plankton out of the water. 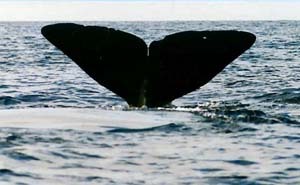 Toothed whales include the sperm whale, beaked whales and all the dolphin and porpoises. These animals have a single blowhole opening and between 2-112 teeth in their mouth. They use their teeth to capture one bigger fish, squid or other marine mammal (in the case of the orca). Below is a list of species that we see off our coast. The first group listed, we commonly encounter, and the others are seen only occasionally. From the Greek megas, for “large”, pteron, for “wing” or “fin”. Length:Adults 45-55 ft; Males, 49 ft, Females, 53 ft. 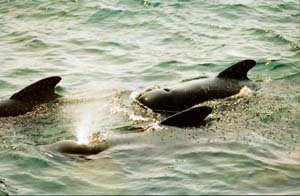 The females are usually larger than males. 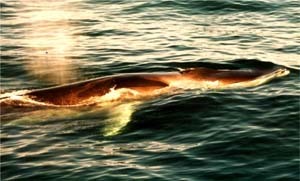 Weight:Up to 70 tons, 2nd in size only to the blue whale. From the Latin acutus for “sharp, pointed”, and rostram for “beak, snout”. Length: 36 ft. in the Northern Hemisphere and 30 ft. in the Southern Hemisphere. 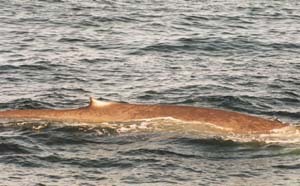 Length: More than 8 feet long; Males are larger than females. Weight: Females are 400 lbs, whereas, males are about 510 lbs. At Birth: Calves are about 4 feet long and weigh around 44 lbs. Length: Maximum length is 6 ft. (1.9 m) Most smaller than 5 ft. Weight: Maximum weight of 200 pounds (90 kg). Most weigh less than 130 pounds (60 kg). The females are slightly larger than the males. These species have been occasionally found off our coast. From the Norwegian name for Pollock, seje, a close relative of codfish. 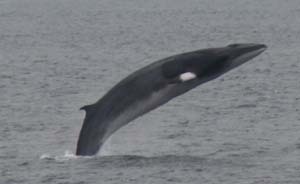 Sei whales appeared off the coast of Norway at the same time each year as the pollock that came to feed on the abundant plankton. Weight: Reaches a weight of over 160 tons and possibly as much as 196 tons. Literally translates to "blower with a big head". Length: Males can reach up to 60 ft. and females about 40 ft.
At birth: 13 ft. long and weighs about 1 ton or 2000 lbs. From the Latin, globus, for “globe” or “ball” and the Greek, kephale, for “head”; from the Greek melanus for “black”. Length: Males, up to 20 feet. Females up to 18 feet. Weight: Males, 3 tons. Females 2 to 2 ½ tons. At Birth: Six ft. in length, and weighing 80 kg.